As both the last month of summer and the first month of fall, September marks the start of many things – most notably school, but also mushroom season in our local woods. So far this year, though, you’d hardly think so, because the drought has made wild mushrooms scarce. If we get a decent rain, that may change. Then you might expect lots of mushrooms to pop up in the woods in the days following the rain. They can appear almost overnight. Look for them growing on the ground or on decaying wood, either above ground or below ground on old buried roots. Mushrooms in our area often come in many different colors, and in interesting shapes and forms. Take the onion-bagel mushroom, for example, which grows on hardwood. It can look temptingly like the food its common name suggests, but like most mushrooms you’ll find in the woods, it is not edible. So enjoy the sight of wild mushrooms, but don’t taste them. In any case, identifying wild mushrooms accurately can be tricky, even for the experts. A good look or a photograph isn’t necessarily enough. A microscope and chemical tests are often needed to confirm an identification of the exact species. 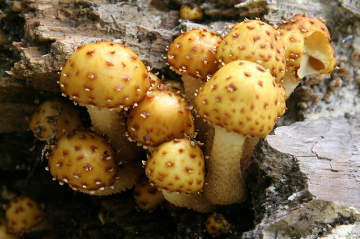 For example, a mushroom that looks like the onion-bagel mushroom is probably Pholiota aurivella (also called golden pholiota or goldskin scalecap). But to be sure, an expert would need to examine its spores under a microscope – and measure them – to tell this mushroom apart from a different but similar-looking one. A mushroom releases dust-like spores from its gills – or other spore-releasing structures in the case of mushrooms without gills – to spread the fungus to other locations. The mushroom itself is the reproductive part of a fungus, which lives year-round as many threads in decaying wood or in the ground (or whatever else a particular fungus grows on). Wind and rain can be helpful in jostling a mushroom cap and knocking the spores out. If you’re interested in the mushrooms and other fungi in our local environment, consider joining Larry Millman, author of the guidebook “Fascinating Fungi of New England,” for a walk in Westborough on Sunday afternoon, Sept. 25 at the Headwaters Conservation Area (Mill Pond school parking lot). Space is limited so please see the WCLT web site () to register or send an email to events@westboroughlandtrust.org .